1. What is a Walkability Action Group? A Walkability Action Group, or WAG, is simply a group of people that promote more walkable, liveable communities by making their suburb, town or neighbourhood a friendlier and better place to live. Well-run, articulate groups can be more credible than individuals in the eyes of government and larger organisations. Not trying to do everything yourself is important! 2. What do WAGs do? Ormond and McKinnon Walks recently celebrated the government's decision to install a pedestrian crossing in their area. They're also keen to promote more children walking to school as well as improving walkability in their neighbourhood. Streets Alive Yarra Founded in 2017 this is a community group of residents of the City of Yarra (which includes Abbotsford, Burnley, Clifton Hill, Collingwood, Cremorne, Fitzroy, North Carlton, North Fitzroy, Princes Hill and Richmond. 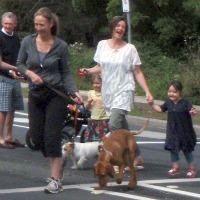 See our list of existing Walkability Action Groups in Victoria and see what they're getting up to! Here are some tips for starting a Walkability Action Group in your area. Join our Victoria-wide Walk Agents Facebook group, founded in 2018.